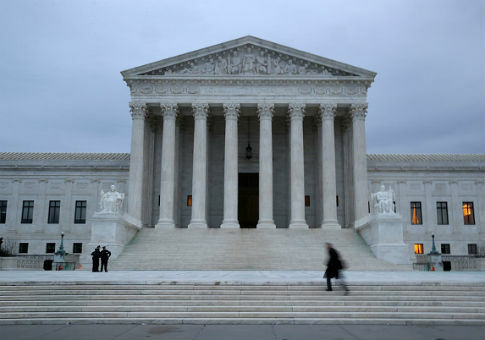 The Supreme Court is set to hear arguments Monday on the New Jersey case Christie v. NCAA to decide the future of sports gambling in America. The justices will review the New Jersey decision to repeal prohibitions on sports betting, a case that has stationed the state's governor Chris Christie (R.) against top American sports leagues, the Washington Examiner reported. Although Christie has had no wins out of the six times New Jersey has taken the case to court, some legal experts feel the tides are about to change. "They don’t need a .500 record, they don’t need to make the All-Star game, they just need to win one time, and this [The Supreme Court] is the ultimate court to prevail in," said Daniel Wallach, shareholder at Becker & Poliakoff law firm. The dispute began in 2011, CNN reports. The controversy started in 2011 when New Jersey voters approved a measure to legalize sports betting to help the casino industries in a faltering economy. But the state law was immediately challenged by professional sports leagues and the NCAA, which pointed to a federal law passed in 1992 that bans state sports betting with some exceptions. The law is called the Professional and Amateur Sports Protection Act and it makes it unlawful for a state to "sponsor, operate, advertise, promote, license, or authorize by law" sports wagering. Nevada was exempted from the law and three other states — Montana, Delaware, and Oregon — had already enacted sports lotteries and were allowed to continue to do so. At the time, New Jersey could have allowed sports wagering if it had acted within a year of the law's effective date, but New Jersey chose not to. By 2012, the state had changed its mind and passed a law to allow sports betting. Sports leagues challenged the law citing the 1992 law, and they won in federal court. New Jersey tried to pass a new law in 2014 that simply repealed key provisions of its prohibitions on sports wagering to the extent they applied at racetracks and casinos. Again, the courts ruled against the state, prompting Christie to take the case to the Supreme Court. The case will make an impact on everything from the National Football League to the National Collegiate Athletic Association to horse racing, one of the oldest and biggest sports betting industries, according to the Examiner. "According to most predictions, or most historic results of how fast these decisions turn around, we could be looking at sports betting in New Jersey by the Final Four," Wallach said. "So, my prediction is a New Jersey victory. I’m just struggling with how sweeping the victory will be." However, Andrew Grandt, a former Green Bay Packers executive and Villanova University law professor, said he believes the popularity of sports gambling platforms like fantasy football have increased the potential for the legalization of sports betting. "We are at a moment in time where gambling has become evolved in terms of attitudes from sports leagues, sports commissioners," Brandt said Friday. "I’ve advocated for some kind of ‘CGO.’ Every league has a CMO, a COO, a CIO, what about a Chief Gambling Officer? Because they have to be prepared." Matthew McGill, a lawyer with Gibson, Dunn & Crutcher, is set to argue for New Jersey on Monday and said his team is looking into the bigger issue, which is "whether Congress can prohibit states from repealing their prohibitions on sports wagering," and if the federal government has the Constitutional right to decide how states regulate sports wagering. Although the case centers on sports gambling, the decision could affect other cases that some classify as states' right issues, including immigration, firearm control, medical marijuana, and occupation licensing, according to former West Virginia solicitor general Elbert Lin. This entry was posted in Politics and tagged Chris Christie, Gambling, New Jersey, Sports, Supreme Court. Bookmark the permalink.